is an European ambient supergroup of sorts, featuring Oophoi, Tau Ceti, Mathias Grassow, Klaus Wiese, Lorenzo Pierobon, Luna, and Mauro Malgrande. This is a beautiful, ethereal and abstract ambient recording, which certainly deserved greater attention than it received prior to the demise of Stella Maris, which existed only long enough to release two Nebula albums. That first release was a limited edition CDR but our reissue is a professionally manufactured CD in a beautiful digipak with new graphics. 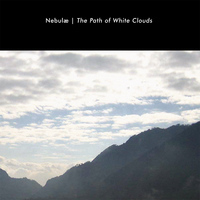 The Path of White Clouds explores a serene and otherworldly soundspace. Meditative and gentle, these six tracks are sure to appeal to listeners who enjoy the more spacious ambient works released by Oophoi during the height of his Umbra and Penumra sister labels. The sound sources utilized here lean more toward the organic and physical instruments, and electronic processing and synthesizers are used subtly to accentuate the rest. In the years since this album was released, Oophoi has grown from just another new practitioner of ambient music to a recording artist as respected and well-loved as any other. We at Hypnos have released other Oophoi works such as Athlit, and his collaboration with Paul Vnuk Jr. (of Ma Ja Le), Distance to Zero. We also have an upcoming release The Martian Chronicles by Oophoi with Seren Ffordd. Usually we focus on releasing new projects, but sometimes a significant early work becomes completely unavailable. In a case such as this, the material strong enough taht we're sure listeners will feel it compares favorably with anything recorded since. The Path of White Clouds deserves to be heard.